Your Idea Crew brings you a simple, yet powerful backup solution packed with features that every website admin/owner would love. Website Backup provides a simple and easy-to-use interface to backup websites and databases. To backup your website, just enter your FTP or SFTP or RSYNC details and backups will be scheduled on a daily basis. Databases can be backed up by providing the hostname and the database username and password to connect to the server. We currently support MySQL(with / without SSH over tunnel), MS-SQL, MongoDB, PostgreSQL databases at the moment. Recovering your website very quickly is key to your business continuity and for this purpose we allow for unlimited restores and downloads from up to 30 backup versions. With the automated one-click restore feature, you can recreate your website and database with a single click. You can easily track any changes to your website files. As a website admin/ owner, you can verify that all file changes in the latest release are correct and ensure it has been backed up properly. Planning for rollbacks is also possible using this feature in association with selective restore feature. Our one-click download feature lets you access your backup anytime and anywhere. Website backups are available as zipped files using the tar format for easy migration to the new server. Users can select any backup version and download the backup files to recreate their website. Databases are backed up as database dump files. You can recreate your database within minutes using the MySQL friendly dump file format. Schedule your backups on a daily, bi-weekly, weekly, fortnightly or on a monthly basis. Website Backup provides you the flexibility to choose the appropriate time of day to start your backups. This ensures that our backup process does not affect the performance of your servers during the peak activity time of the day. Select the exact hour and time of the day when you want the backup to start and we will handle the rest. Website Backup also provides you with the option to perform an on demand backup. Website Backup allows you to monitor the up-time of your website and notifies you via email in the event of a server or network outage. Website Backup lets you analyze the response time (in msecs) of your website from around the world and view them graphically on a chart. You can monitor the performance of either a GET, POST or a HEAD request. Website Backup has integrated Google’s Safe Browsing into our services. This way we will notify you if Google determines that your website contains suspected malware / or suspected phishing code and is deemed not safe for browsing by Google. This is integrated with website and database backup for faster recovery. Migrating a website and its database could not have been easier now. Just create source and target profiles (website / databases) on Website Backup and restore from source to target website / database. Your Backup Crew pays special attention to ensure that your backups are secure while backing up and when stored on our servers. 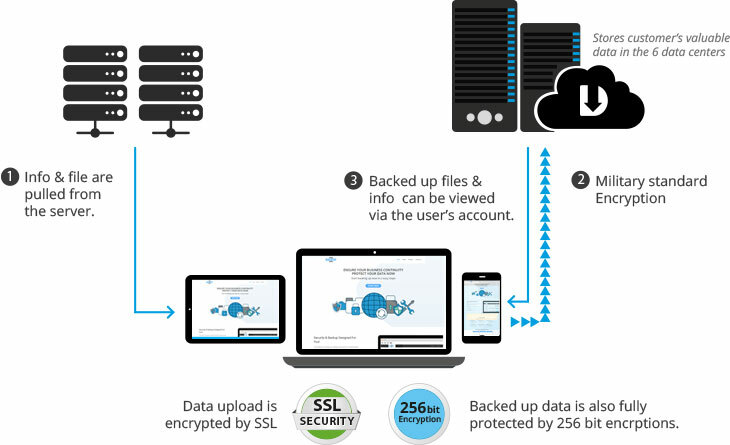 Website Backup deploys military-grade encryption to protect your data. This includes AES 256-bit encryption, at rest and in transit, as well as Secure Sockets Layer (SSL) endpoints. All backups are stored on Amazon Web Services data centers which have multiple system security and data protection certifications, including SOC1, SOC2, SOC3, and ISO-27001.